Attorney and Staff Profiles - Gary, Dytrych & Ryan, P.A. 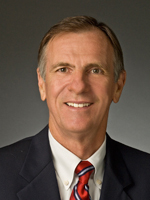 Larry Smith has been an attorney in private practice since 1981 and has been serving Palm Beach County, Florida, as a member of Gary, Dytrych & Ryan, P.A. since 1983. His areas of concentration include wills, trusts and estate planning, probate, elder law, and business and real estate matters. Mr. Smith is AV Rated, the highest possible rating established by Martindale-Hubbell, the premier independent rating agency for attorneys. Prior to becoming a lawyer, Mr. Smith was a practicing architect and land planner in Palm Beach County. As a lawyer, he has maintained a practice with an emphasis on real estate, business law and, for the last several years, estate planning and elder law. He is a member of the Florida Bar and the Palm Beach County Bar Association. He is also a member of the National Academy of Elder Law Attorneys and is one of only two members in the Palm Beach area of the prestigious American Academy of Estate Planning Attorneys, an educational organization promoting the highest standards of excellence in the estate planning profession. He has been published in the Florida State University Law Review and the Florida Bar Journal and co-authored Florida Arson Prosecution- A Trial Manual for Florida Prosecutors. Mr. Smith completed his Bachelor of Architecture degree at the University of Florida where he was inducted into the Honor Society of the College of Architecture and Fine Arts. He received his Juris Doctor, with Honors, and a Master of Science in Planning from Florida State University where he was a legal research and writing assistant and a member of the Florida State University Law Review. Mr. Smith is married and has one daughter. He lives with his family on Singer Island in Riviera Beach, Florida where they enjoy friends, family, boating and an occasional trip to the Bahamas or the Florida Keys. He has been a long time member of both an Advisory Board for the Area Agency on Aging Palm Beach/Treasure Coast, Inc., and the City of Riviera Beach Parks and Recreation Advisory Board. Larry also participates in the Big Heart Brigade, a non-profit organization providing food for needy families at Thanksgiving.